In reflecting on 2013, I know many of you are thinking about where you can support real change. With pride, I sit on the Advisory Board of World Can't Wait. My name was alongside others -- perhaps yours -- in the Close Guantanamo Now Statement which ran in the New York Times as a full-page ad in May. 'Unwavering' and 'ahead of the curve' are how I describe this priceless organization and why I regularly join them in speaking out against the crimes of this government. I can count on World Can't Wait to stand with the people of the world; the most vulnerable, those whose lives are devastated by the crimes of this government. 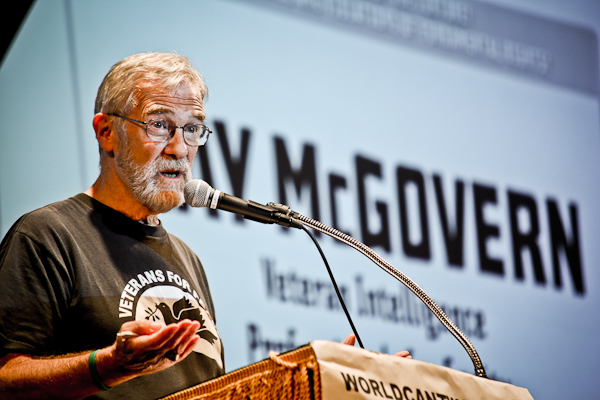 Ray McGovern speaking June 19, 2013 at World Can't Wait's Emergency Forum on NSA Spying, two weeks after Edward Snowden's revelations revealed mass surveillance of whole populations. I can count on World Can't Wait to take immediate action when new outrages are exposed and mobilize people quickly to speak out against wars of aggression like they did earlier this year spreading protests against war with Syria. I can count on them to stick to their mission no matter who the president is, running on all-volunteer energy and constantly going out to the people. World Can't Wait runs on a shoe-string budget with my friend Debra Sweet, their director, receiving a very modest stipend. Yet they do remarkable things: publishing public ads, the first public forums after the NSA leaks, and showing up with replica Predator drones where they are needed the most to inform people. During their end of year fund drive they work to support not only their ambitious projects such as the Close Guantanamo Now Tour (covering expenses like airfare, lodging, venue rental, and promotion) but also for their national office in New York City which does so much for those who want to take action to stop the crimes of our government. No matter who you are or where you are...no matter if you can give $10 or $500, you are needed. World Can't Wait helps people act on their own conscience. I invite you to act on yours and donate generously to World Can't Wait. Ray McGovern leads the “Speaking Truth to Power” section of Tell the Word, an expression of the ecumenical Church of the Saviour in inner-city Washington. A former co-director of the Servant Leadership School (1998-2004), he has been teaching there for 15 years. As an ex-CIA agent, he was in position to masterfully confront Donald Rumsfeld in 2006 on his lies about the US war on Iraq. World Can't Wait was glad to have helped arrange his presence at Rumsfeld's speech in Atlanta. See his latest: Truman's True Warning on the CIA. Please make a year-end donation to World Can't Wait's work for 2014. 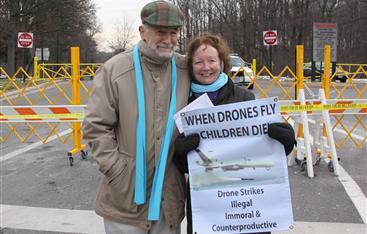 Ray McGovern & Kathy Kelly outside CIA headquarters December 2013, protesting the U.S. drone war.